I have to admit that on occasions my hockey glass is half empty and last Saturday was one of those occasions! From the moment the Girls’ Development conceded their first goal of the season in losing to Norwich City in the opening game at Weybread until the Ladies’ 4ths lost to Norwich City 3rds I was not the only one to feel a sense of gloom. Played eight, lost seven was our home record. Fortunately the weather was mild for the considerable number of spectators and we were cheered by the Ladies’ 7ths beating Loddon 2nds 5-2. We were further cheered by the news that away from home the Men’s 2nds had beaten Blueharts 2nds 4-1, the Boys’ Development had beaten Norwich City 7-2 and that there were draws for the Ladies’ 3rds, Men’s 3rds and Men’s 5ths. The Ladies’ 7ths and Men’s 2nds deserve joint top billing this week for their excellent wins and I will start with the Ladies’ 7ths who are a happy blend of youth and experience including some ‘back-to-hockey’ Mums. Fiona Brice, playing in central midfield, put them two up against Loddon 2nds in the first six minutes and after a response from Loddon Fiona completed her hat-trick by half time. Evie Tibbenham put them further ahead with her seventh goal of the season and while Loddon again hit back Fiona was on hand to make the final score 5-2. The team celebrated with sherry and After Eights! I always ask our away captains to give me a few words regarding their games and I can do no better than quote Lawrence Baynes in full regarding the Men’s 2nds very welcome win over Blueharts 2nds. We got our first away win on Saturday. Tris [Baynes] scored a short corner, then Vince [Leruth] scored a tap in after Matt Bensly had done some good work down the base line. 2-0 at half time. We soaked up a lot of pressure with George [Baldwin] playing well in goal. Tris scored an open play goal then got his third with a cracking drag flick into the top left corner. They scored a consolation in the last minute. Tris MOTM. The Girls’ Development, under player-manager Sandra Elliner, have enjoyed an excellent season (when their opponents are not calling off) and their 2-0 defeat by a talented Norwich City side was a reminder that losing is an inevitable part of playing sport and they are sure to bounce back after Christmas. We have now gratefully received eighteen ‘Promises’ – please see the club’s website for more information and for full details of the event including how to offer ‘Promises’ or items for auction! This is the club’s major fund raising event of the season and provides an opportunity for everyone to make a contribution by offering Lots and/or attending the evening to make bids. Next into action were the Ladies’ 5ths looking for their seventh straight win and when 2-0 up against Diss with goals by Jose Tibbenham (the team’s leading scorer with 10) and Grace Collison all seemed to be going nicely. However, Diss hit back in the second half to win 3-2. This was an awful and lethargic display by the team and their worst in three years. Not my words I hasten to add but those of skipper Jose! Let’s hope a 10.00am start at bracing Lowestoft away to Railway this coming Saturday sees them return to form. After losing to Dereham in the closing seconds on the first day of the season the Ladies’ 2nds were looking to right matters in their return game but it never happened as, frankly, they never really got going after Dereham converted a fifth minute penalty corner. Dereham looked sharper throughout and they increased their lead with a sweeping move from right to left. To their credit Magpies didn’t concede again in a goalless second half and despite this disappointing defeat they can be pleased with their season to-date. 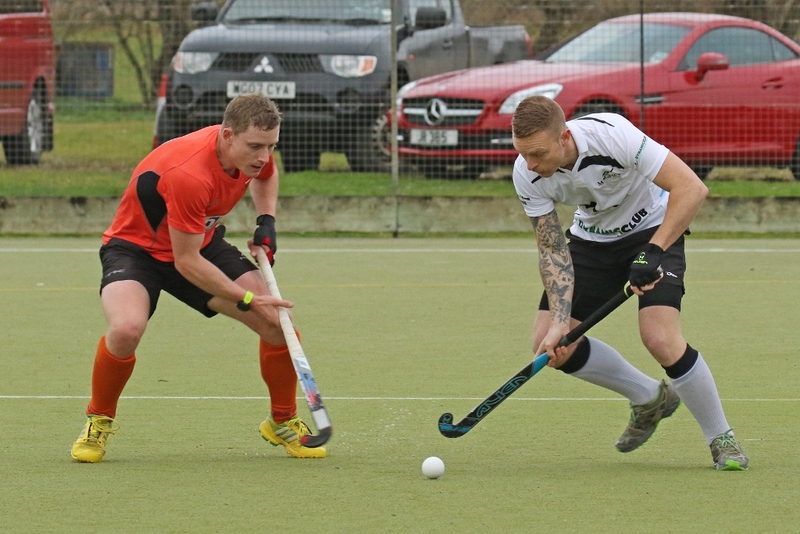 If you want to see goals and some fast and exciting action the Men’s 1sts are your team – with plenty of goals at both ends! Wearing their smart new waterproof shirts for the first time, supplied by team sponsors Dynamic Club shops, they were up against second-placed St Albans looking to reverse their 4-1 opening day defeat in a game which the St Albans’ management admitted could have been won by Magpies. In another exciting game Magpies started and ended the game on top. Between these phases they went 3-0 down (2-0 at half time) before fighting back to draw level with ten minutes remaining. Ben Wright converted a penalty stroke for his 22nd goal of the season before a brace by MOTM Myles King (a skilful deflection and a shot just inside the left post) had the home support buzzing and urging their team onto victory. But with two minutes to go and with Magpies’ skipper and defender Leigh Sitch off injured St Albans mounted an attack down the right and their bench were cheering the winner before the ball hit the back of the net. A draw would have been a fair result but sport doesn’t work like that. ‘Well done’ to St Albans, coached by England manager Andy Halliday, and the same praise to Magpies, despite their first defeat since 1 October in a game a credit to our sport, and to umpires Peter Lemon and Nick Lockhart. The game was sadly the last for Magpies by James Meek. James, who is an avionics technician, is leaving the army at the end of the month and returning to Doncaster where he has bought a house. His plan is to join Doncaster HC while looking for another engineering job either in this country or abroad. Meeky, who has played for the Army, joined Magpies in December 2013 and quickly established himself as both a hard working first team player and a very popular and committed member of the club. We will miss him and we wish him all the very best for the future. James knows he will always be very welcome back at the club as a player or just socially. A quick look now at other home games. The Men’s 4ths copied the Ladies’ 5ths in surrendering a 2-0 lead after goals by Neil Watson and Alex Kilbourn to lose 3-2 to Lowestoft Railway 2nds; the Men’s 6ths were up against third placed Dereham 3rds going down 5-0 while the Ladies’ 4ths were not at their best in losing 3-0 to Norwich City 3rds in the last game of the day. While I type away it has just dawned on me that we got something from all our away matches so Saturday’s gloom has lifted a little! I have already covered the Men’s 2nds. The Ladies’ 3rds got a good point in their 1-1 draw with Yarmouth who are just above them in their league. The club’s leading scorer Georgie Cantrell got their goal taking her total for the season to 26 (including goals she has scored for the 4ths and U14s). The Ladies’ 6ths got an excellent 1-0 win over high flying Norwich City 6ths with Lydia Barrett scoring in the second half while the Men’s 5ths drew 3-3 with Thetford Town. Two down in the first five minutes they fought back well with a brace from Andy Johnson bringing them level. James Harvey was in top form in goal. After the break Andy completed his hat-trick before Thetford got a deserved equaliser. Despite a strong start the Men’s 3rds found themselves 2-0 down against Lowestoft Railway before Greg Jagger created an opening for Gavin Cole. Now playing the better hockey Magpies drew level when Gavin scored his second with a penalty stroke conversion and they went ahead five minutes from time through Jon Aldridge only for Railway to get a deserved equaliser making the final score 3-3. Meanwhile the Boys’ Development were scoring seven goals for the second successive week in beating Norwich City 7-2. They were 3-1 ahead at half time through Ed Brice, Joe Wicks and Archie Derbyshire before further goals by Joe, Ben Emms and two from Sam Emms after he was moved to centre forward. The club is through to the quarter-finals of the England Hockey Men’s Over 40’s Cup following their 6-0 away win on Sunday over Luton Town. First half goals by skipper Tristan Baynes, who was in commanding form before tearing a hamstring in the second half, and Gavin Cole, with a brace, had Magpies three up at half time. After the break Magpies continued to dominate, except for a good spell by Luton near the end of the game, and further goals came from Roger Kent (2) and Gus Wilkinson. This was an excellent performance by the Magpies ‘eleven’ who will be hoping for some of their injured team-mates to be fit, including Tristan, for the next round on Sunday 12 February away to Cambridge City. The U18 Boys have been granted a lifeline with the news that Norfolk now has two representatives in the East Indoor Finals so they will be joining Norwich Dragons at the UEA on Saturday. With most league fixtures now over until after Christmas our only teams playing on Saturday, in addition to the U18 Boys, are the Ladies’ 3rds, in a re-arranged fixture against Ipswich 2nds (NB. now 11.00), and the Ladies’ 4ths, 5ths and 6ths. Good luck to all our teams. Please see the website for more details.